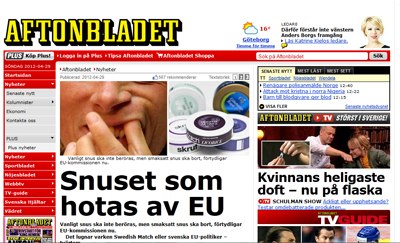 Lately the EU snus-ban has got a lot of attention in the Swedish press - Finally! Since the EU took it one step further and said they want to ban some ingredients commonly used in Swedish snus, which threatens the whole manufacturing of Swedish snus. This upsets a lot of people in Sweden. Taking away snus from the Swedes is like trying to take away a bottle of milk from my 7-weeks old, food-loving son (never seen anyone so mad). Yesterday the Swedish newspaper Aftonbladet published a list of snusbrands that is threatened by this new ban. This is the list translated (in a hurry, since little Henry will wake up pretty soon). This list is not complete though there are a lot of other snusbrands that contains these flavours. For example one of Swedish Match's most popular brands, General, contains citrus aroma. When will people realize that snus helps people quit smoking = saves lifes! Snus does not harm anyone like second hand smoking does! It makes me crazy mad when people smoke near little Henry. Let people decide for themselves and leave our snus alone!